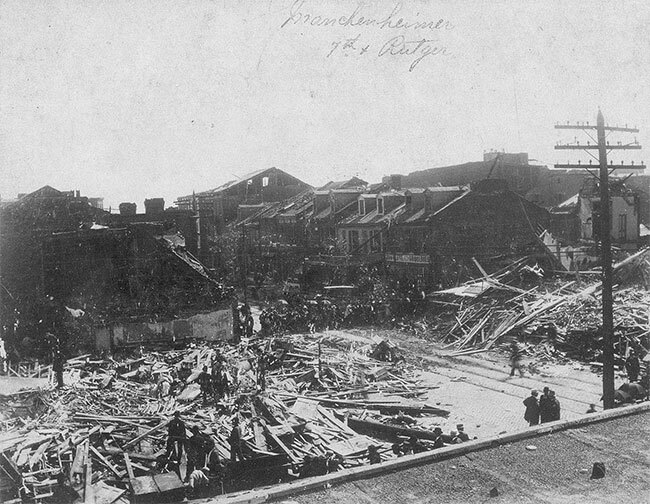 This was a saloon and tenement house owned by Frederick Mauchenheimer, located at 7th and Rutger Streets in the Soulard area, one of the places hit hardest by the tornado. Many people lost their lives at this intersection. In this scene, several men and groups of people pick through the ruins. 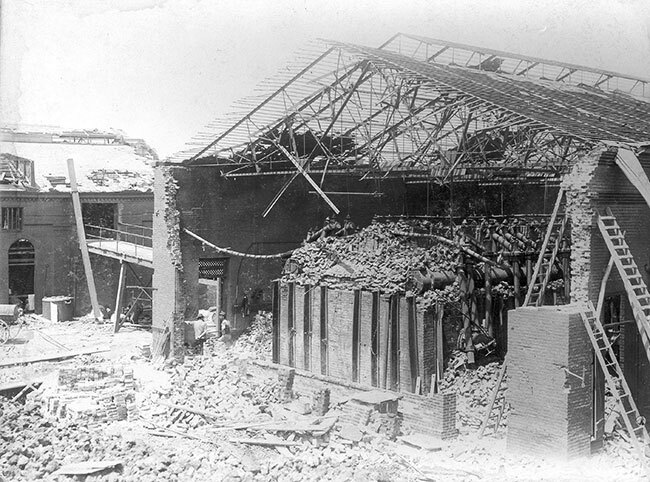 Leading local photographer J. C. Strauss photographed this damaged building, identified as Central Garden in a booklet about the tornado. The sign visible on the left indicates that this is the saloon of John F. Rudolf. City Directories list this saloon as being located at 1726 South 18th Street, putting it in the Lafayette Square neighborhood where the tornado did its greatest damage. The roof is missing from this household storage business, revealing a massive jumble of furniture and other items. Geair’s Furniture Warehouse was located at Jefferson Avenue and LaSalle Street. 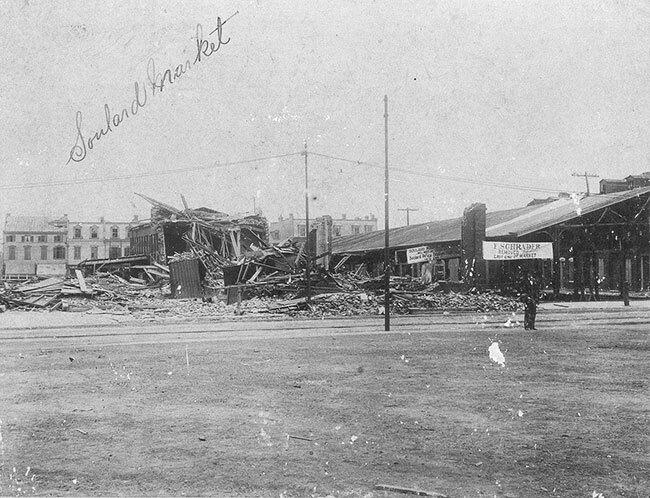 This business area of South Broadway, north of Barry Street, sustained heavy damage from the tornado. 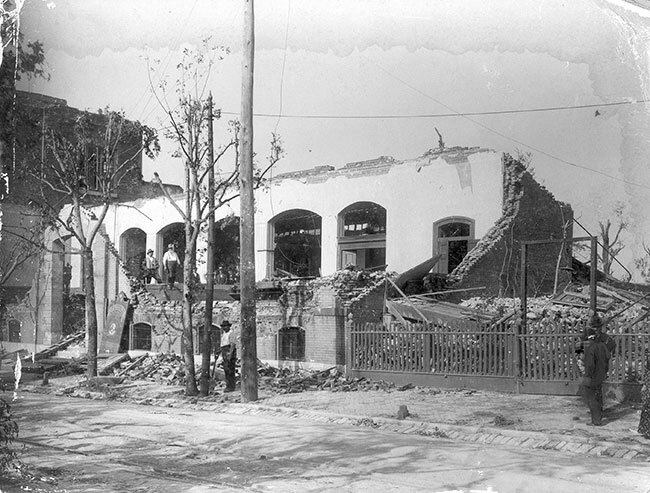 Walls and roofs are missing, broken telephone poles and wagons are heaped in the street, and people are milling around or busy trying to clean up. Freudenberg's saloon (1437 South Broadway), a brush company, and a liquor store are among the businesses visible in this photograph. The tornado struck the United Elevator Company's elevator B. In this view, a painted advertisement for Battle Ax Plug Tobacco (the largest piece of good tobacco ever sold for 10 cents) is seen on the wall facing the viewer. 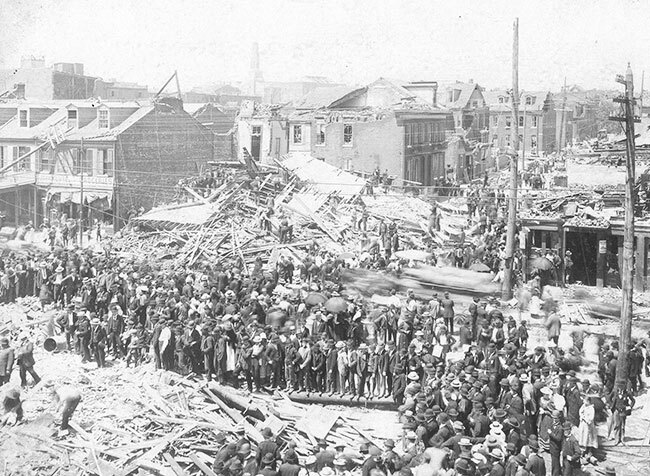 The tornado struck this intersection in Soulard with particular force, causing many deaths at this location. A large crowd gathered at the site of Mauchenheimer's saloon, whose address had been 1300 South 7th Street. Across the street, Klute's Grocery, at 1305 South 7th, still stood. In the distance, the damaged church of St. Vincent de Paul, at Park Avenue and 9th Street, can be seen. The Peper Cotton Compress facility was located just off the levee at Broadway, Rutger, and Convent Streets. This company was a major cotton compression business, enterprises that compressed cotton into smaller bales for easier transport by rail and river. The company was founded by Christian Peper, the leading St. Louis businessman who also headed the Peper Tobacco Company. 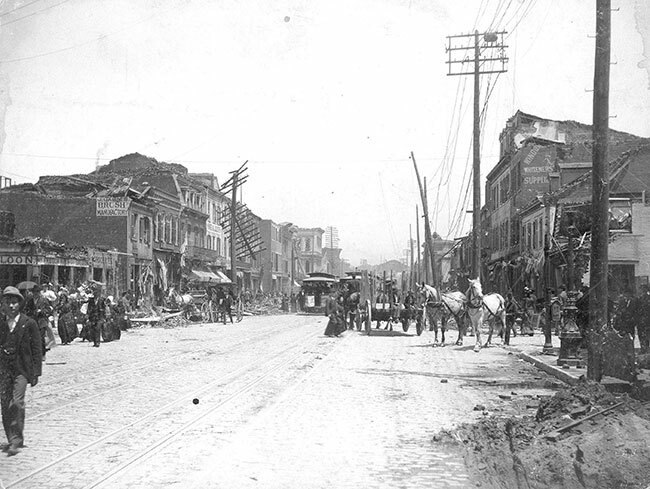 Collins Livery Stables and Undertaking Company was located at 1917 South Jefferson Avenue at its intersection with Geyer, just southwest of the hard-hit Lafayette Square area. Signs on the building announce livery, boarding, funerals, and embalming. 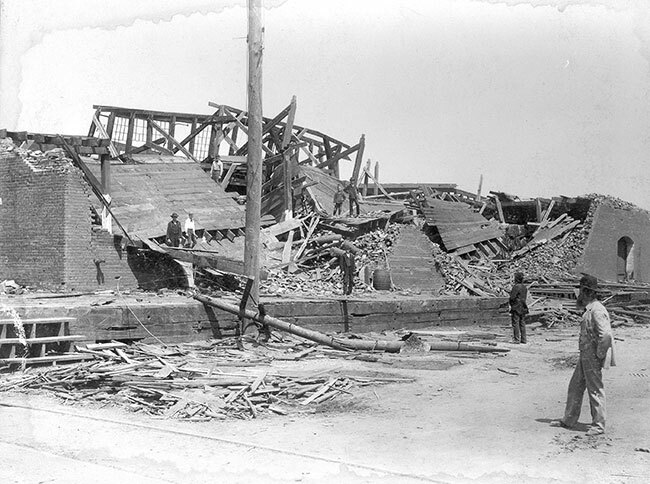 Ruins of the Laclede Gas-Light Plant. 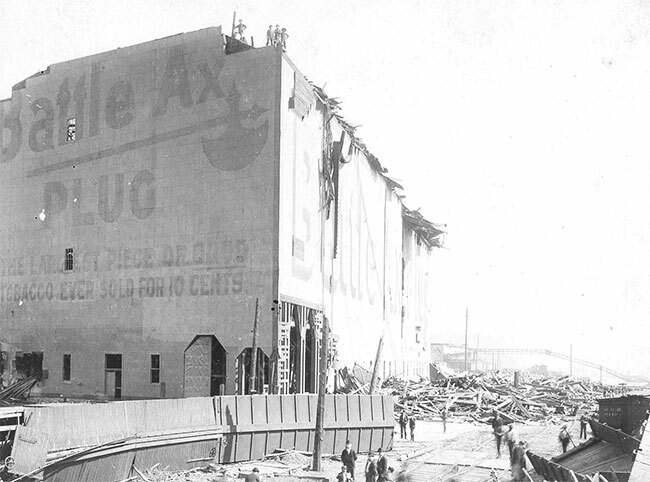 In this building, located at 2nd and Convent streets near the Mississippi River, coal was unloaded from barges. The coal was burned in large furnaces, creating the energy that powered the city. 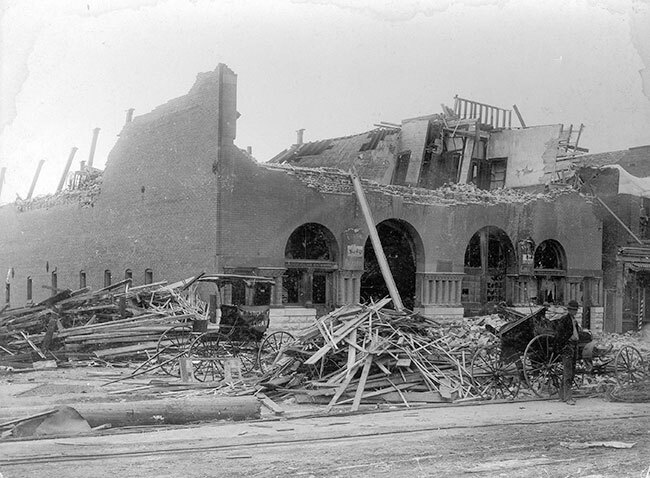 The tornado hit here after it wreaked havoc in Compton Heights, Lafayette Square, and Soulard, and before it skipped across the river to damage Eads Bridge and East St. Louis. The Heier and Wiebusch Livery business was located at 1615 Lafayette Avenue, just east of Lafayette Square. 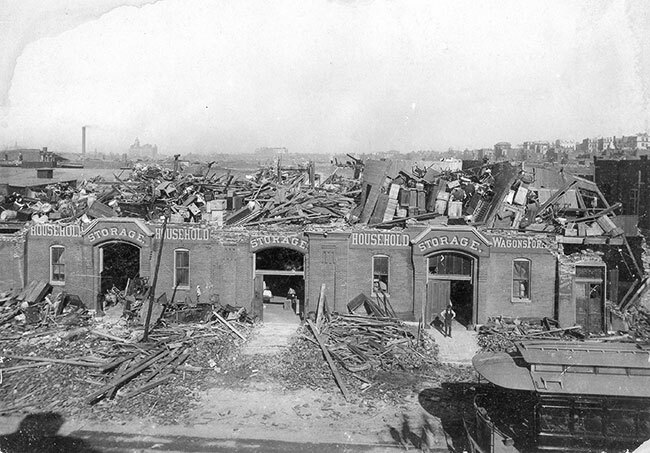 The tornado blew away the building's second story and littered the surrounding area with broken carriages. Soulard Market, established in 1841, is one of the oldest surviving open-air farmers' markets in the country. 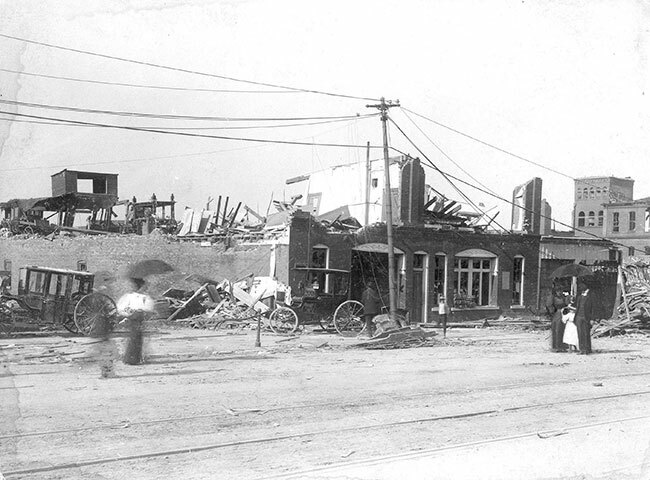 Still located at South 7th and Carroll Streets, the buildings that were destroyed by the 1896 tornado dated to the late 1840s. Several people lost their lives at this location.